Royal Air Force Officer's Interwar Period Full Dress Uniform Busby. Tailored by Burberrys Ltd., Haymarket, London. Introduced in June 1921 under AMWO 551 it was comprised of a cork skull cap covered in black leather and trimmed with seal dyed nutria. With plaited gold/blue lace cord around the front/sides and central silver and gilt RAF badge. A deep red silk lining bears the manufacturer's details at the crown. With inner leather band and black patent leather chin strap. 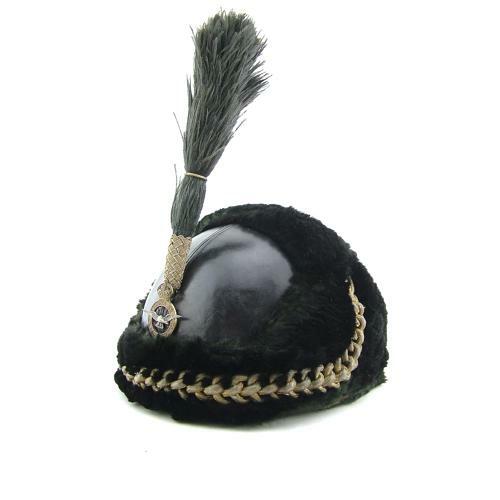 It retains the original dyed ostrich feather plume with gilt ring mounted within a gold and blue bullion basket weave holder. The busby has very minor marking and a little rubbing of the fur in places. Similar light wear to the lining. Excellent plume. A fine example of this rare ceremonial interwar headwear. Stock code U22568.